But one day he hears that a famous rabbi is visiting his city and something in him makes him want to see who this rabbi is. And so Zacchaeus runs to where Jesus is but he can’t see above the crowd because he was a short guy. So he runs ahead of Jesus and climbs up into a sycamore tree. And Jesus reaches this tree, looks up, and says “Zacchaeus!” I sometimes wonder what ran through Zacchaeus’ mind when Jesus called his name. Did a jolt of fear strike his heart in expectation that once again he’d be subjected to scorn from a religious leader? Was he amazed that this wandering rabbi would even acknowledge him? But Jesus doesn’t scorn Zacchaeus. Quite the opposite. He says “Zacchaeus, come down from that tree, for I must stay at your house tonight.” Now this might sound rude to us in our culture. Who does Jesus think he is to invite himself around to stay at someone’s house on such short notice and expect them to feed him? But to have a rabbi stay at your house was a great honour because the rabbis only stayed with the most respectable members of Jewish society. To understand what Jesus did in today’s terms would be like if Bill Gates was to visit one on his manufacturing facilities and say to the janitor “You might want to ring the wife and tell her I’ve decided to cancel my dinner with the management team because I’m coming around to yours tonight. Also I hope you don’t mind if I spend the night on your couch”. But Zacchaeus ignores the crowd. After all, he’s had a lifetime of constantly being reminded that he’s a dirty sinner and that he’ll never be as good as the religious folk. But this day Jesus has treated him with love and dignity. Zacchaeus declares in that moment that he is going to give away half of his possessions to the poor, which is more than the accusers in the crowd have ever done, and he declares that he will repay those he has cheated four-fold. Interestingly this isn’t the first time a tax collector is portrayed favourably by Jesus. If we go back one chapter to Luke chapter 18 Jesus tells a parable of a Pharisee and a tax collector who go to the Temple to pray. The Pharisee prays “God, I thank you that I am not like other people—robbers, evildoers, adulterers—or even like that tax collector. I fast twice a week and give a tenth of all I get.” Meanwhile the tax collector stands at a distance, with his head hung in shame, beating his breast, and praying “God have mercy on me, a sinner.” Jesus declares the one who exalts himself will be humbled, and the one who humbles himself will be exalted, and that only one of those men went home justified before God. I don’t think it’s a coincidence that Luke put these two events so close together when writing the Gospel. I think he was trying to tell us something about those who are hurt by religious folk and how God views them. There are many ways in which someone can be hurt by the church. There can be a breach of trust in which embarrassing information about someone is spread around the church. Church politics can lead to someone getting a knife in the back (both metaphorically and literally!). Maybe the church culture was toxic and was obsessed with policing who was in and who was out, making people feel unwelcome. Some of you may remember that in our June 18th newsletter Susan wrote a reflection called “Is our Church Safe?” which included 12 characteristics of a counterfeit or toxic church. The popular Christian writer Benjamin L. Corey recently wrote a blog post called Christian Ghosting: The Destructive Christian PracticeWe Don’t Talk About. It described his personal experience of ghosting: the practice of suddenly ending a friendship with little to no explanation why and then cutting all contact. It’s a particularly passive and cruel practice in which a community will push someone out and it often affects entire families. One week you can be enjoying the company of the people you have fellowshipped with for years and the next you can be left all alone to deal with your problems without any support. And of course there are some people who are hurt by the church without even setting foot inside a church. They are hurt simply by Christians treating them poorly for being different or a member of an unacceptable group. And so these people put up walls and walk away with the impression that all Christians are hypocrites or hateful. How many of you had ever heard the perfect answer to the charge that the church is full of hypocrites? You’ve probably heard the situation played out by over-confident preachers or on bumper stickers. 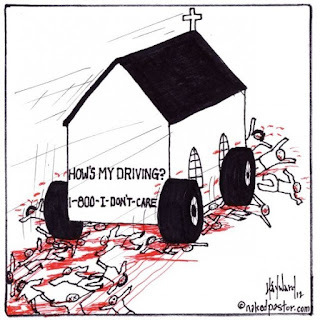 The non-Christian says “I don’t want to go to church; it’s full of hypocrites.” And you smoothly reply, “Well, the world is full of hypocrites”. Boom. Mic drop moment. With this bit of wildian wit you have completely obliterated their case against going to church. In that moment you are Saint Paul preaching to the Athenian philosophers on Mars’ Hill. You are Billy Graham leading a one-man crusade for the soul of this person. But there’s one problem: Jesus never said to be just like the world. At no point are believers encouraged to be just like unbelievers in how they treat others. In fact, Jesus says “If you love those who love you, what reward will you get? Are not even the tax collectors doing that? And if you greet only your own people, what are you doing more than others? Do not even pagans do that?” “Hey at least we’re no worse than the rest of the world” doesn’t cut it for Jesus. It’s not an acceptable baseline. So what do we say in this situation? How do we respond to someone saying that the church is full of hypocrites? I suggest you ask them why they say that. They might be misinformed. It may be that they have a valid criticism of Christians. But it may also be that their statement isn’t hypothetical; it’s possible that their belief comes from personal experience in being hurt by the church. Maybe they didn’t receive grace and love from the church when they needed it most. Maybe they saw the church tear down one person while turning a blind eye to another. Maybe they were made to feel like they didn’t belong until they eventually left. The point is that by saying “well the world is full of hypocrites too” you shut down any chance of productive dialogue with this person. By getting defensive and putting up a wall you have confirmed their suspicion that church folk aren’t serious about change and growth. The answer is a willingness to be humble and vulnerable. The next person in the booth was a young man named Jovan who revealed that he had stab wounds because he had been bashed for being gay on multiple occasions. After this confession Dan poked his head out the door and saw that there was a large crowd waiting in line at the entrance to the confessional booth. And each person who came in thanked him for his kindness and had a very vulnerable and honest conversation about the ways in which they had been hurt. An apology has amazing power to level the playing field. And this wasn’t the first time this approach had been tried. Dan Merchant got the idea for the confessional booth while reading Don Miller’s account in Blue Like Jazz of setting up a confessional booth while in university and apologising for the sins of the church. In March 2000, Pope John Paul II gave a historic speech apologising for the sins of the Catholic Church over the past 2000 years. He was begged by people inside the church not to apologise as it would diminish the Church’s authority and power. But I am convinced that it’s when the church tries to hold onto power and control with tightly gripped hands that it loses its way and hurts those it is meant to minister to. “When your interior life is a mess, when you’re racked with worry and guilt and anxiety, you’re desperate for a distraction, something to take your thoughts off of the pain and chaos within you. Which often expresses itself in judging and shaming and condemning others. I know that as a guy when I’m feeling frustrated, rejected, and not in control I start to feel angry. Now, anger isn’t necessarily a bad thing, but left unchecked it has a tendency to give you the feeling of being in control when in reality your anger is controlling you. That’s why Ephesians 4 says “In your anger do not sin: do not let the sun go down while you are still angry and do not give the devil a foothold”. It doesn’t say do not get angry, it says that we inevitably get angry but when we do we should deal with it appropriately. The problem when we repress our hurt and push it down is that it becomes like a niggling wound that never quite heals. And every new wound picks at that old wound. Every new hurt piles on top of the old hurt until we’re dying under the weight. And often like a wounded animal we lash out at anyone who tries to get close. The good news is that you don’t have to stay in that hurt. It may not go away overnight but you can begin the process of healing. Sometimes that means acknowledging that you have been hurt. You may have to talk and pray about it with a trusted friend or member of the church. It may be that you also have to acknowledge the ways in which you’ve hurt others. And it inevitably involves learning to forgive those who hurt you. If not for their sake but for your sake. Part of forgiving someone is making the decision that the hurt doesn’t have a hold on you anymore. Dan Merchant, Lord, Save Us from Your Followers: Why Is the Gospel of Love Dividing America? (Place of publication not identified: Thomas Nelson, 2012), 168-70. Rob Bell, What Is the Bible? How an Ancient Library of Poems, Letters, and Stories Can Transform the Way You Think and Feel About Everything (New York, NY: HarperOne, an imprint of HarperCollinsPublishers, 2017), loc 1185.